In my experience, there are two types of people in the world. The first type begins by trusting everyone they come in contact with and continuing that trust until the other person proves they no longer deserve it. The second type of person doesn’t trust anyone they meet until that other person gains it. I fit the first type. I start off taking people on faith in pretty much everything until someone destroys that trust through some action. Rarely do words destroy my trust in people, but actions certainly do. Because of my background as a race driver, driving instructor, coach, and sometimes a so-called traffic safety “expert” (I’ve heard that an expert is someone from out of town, and maybe that’s why I travel a lot—I can continue to be an “expert” if I keep going out of town), many people feel intimidated if I’m riding as a passenger with them. They act like I’m judging them, critiquing them, and who knows, maybe even writing up a report to send to the police. I’m not doing any of those things. I trust people to drive well—at least until they prove to me that I shouldn’t. Taxi drivers destroy my trust in less time than just about any other type of driver. I was once in Atlanta with a few people from one of the sponsors of my Indy car. Four of us were in a cab to go from the hotel to a restaurant for dinner. Shortly after we pulled away from the curb, one of the sponsor’s executives mentioned to our cabbie that I was a professional Indy race car driver. That comment was like waving catnip in front of a kitten. Our taxi driver immediately became frisky, bore down on the gas, and instantly started going forty miles per hour faster. Perhaps he thought that if I were impressed enough, I’d ask him to take my place racing my car at the Indy 500, where he’d take first place, celebrate in the victory circle, kiss the pretty girls, collect a million dollars, and be famous throughout the world. I swear I could see those thoughts going through his head. I stopped trusting his driving the second his foot pressed down on the gas pedal. If I ride with you while you drive, know that I believe in you completely…at least until you destroy that trust. As long as you don’t drive like an idiot, I’ll continue to trust you. Back to my general trust philosophy. You know what the problem with the second type of person is, the person who starts every relationship by not trusting the other person? People can sense the absence of it. 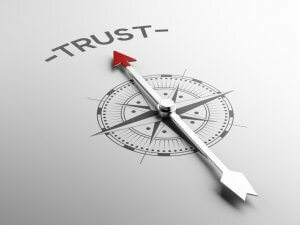 And if a person feels as though they’re not trusted, they’re unlikely to return that trust. I mean, who trusts a person who doesn’t trust them? I guess that’s why I start off by trusting people, stupid as it may be. Through the years I’ve had a few times where people took advantage of me and my trust. But when I compare that to the relationships I’ve built because of my approach to starting by trusting, I know I’ve won much more than I’ve lost. I believe that people who don’t trust others from the beginning rarely, if ever, get hurt or taken advantage of by others. But I know for a fact that they have not created the relationships I’ve been able to. While their losses may have been fewer, for sure their wins have not been as big, as exciting, as often, and as rewarding. Well said, Ross! I too am the “first type” of person you describe. To me it is a more positive, hopeful and communal approach to life, which our world sorely needs. My glass is more often than not “half-full” and people I contact are worthy of my trust until they prove otherwise. Fortunately for me, the latter has happened seldomly. Aloha! WOW so well put- I too, want to take people at face value, and really want to believe in people. That’s not to say I’ve struggled with that at times, especially after being burned. I was actually reviewing your speed secrets book on Amazon and was drawn to your website. Ross, your article pulled me in and I can’t wait to get your book. When I hire new employees, I really want to remember that last sentence.